The craftsmanship from 1936 is nice. No computers were harmed in the production of this engine. Almost every nut here is fine threaded. Note the safety wire on rod and main caps. 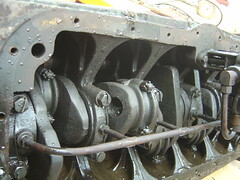 The prominent plumbing is the oil feed to the main and rod bearings. Apparently they hadn't mastered the art of drilling internally through the length of the block yet. I've got 2 of these now, and hoping to build one that runs. Why? I don't know, other than preservation of history. The second engine has one *very* busted cylinder. Oh well. 1936 nash lafayette for sale runs body in good condition.interior in good condition.cotact me at bobchevy101@aol.com or 765-860-8504.